From May to October, several thousand GIS users across the globe will be converging on Cape Town, São Paulo, Split, and Kuwait City—disparate points of the compass that share one huge distinction—all are venues for Esri's 2014 regional user conferences. These annual forums of all things GIS are the biggest GIS technology exhibition, training, and networking events outside of the Esri International User Conference held in San Diego each year. It doesn't matter if you're a novice GIS user or an experienced developer or analyst; attending a regional user conference will offer you opportunities to learn the latest technology from the best minds in the field, share your success stories with regional peers, and network with colleagues and exhibitors. You'll return home energized, inspired, and armed with new confidence, tools, and techniques that will help your organization maximize its leverage of GIS applications in pursuit of its goals. Excitement is mounting as the inaugural 2014 Esri Africa User Conference (AUC)—to be held in Cape Town, South Africa—draws near [postponed—new dates to be announced]. "This will be the first gathering of all Esri users in Africa along with leading Esri experts," says Esri South Africa marketing executive and organizing team member Lauren Sweidan. About 700 attendees are expected from key countries, including South Africa, Rwanda, Kenya, Ghana, Namibia, and Angola. Conference organizers anticipate that some sessions will be conducted in French. Hands-on training will be a highlight of the conference as users take advantage of this opportunity to develop and build skills. Another highlight: this will be the first time many users will hear Esri founder and president Jack Dangermond speak, as well as other international guests, Sweidan says. Paper sessions will allow the sharing of experiences, lessons learned, and best practices. But their biggest value will be to share challenges users face in similar environments, she says. "Take this unique opportunity to share our story with other Esri users, so that all of Africa can benefit from your experiences," says Patrick McKivergan, managing director, Esri South Africa (Pty) Ltd. "This is an ideal time for knowledge transfer in Africa." According to Sweidan, the EXPO area and Esri Showcase will provide an excellent opportunity for users to meet and exchange ideas in an informal setting. In addition to the many networking lounges, delegates will be able to relax and enjoy social functions to be held on Tuesday and Wednesday evening. With Table Mountain as a backdrop, delegates will enjoy magnificent views while meeting new faces. "For the first time, users from diverse countries in Africa will be able to network," Sweidan says. For further information, visit esri.com/auc. An infectious samba beat will welcome GIS users arriving at the Royal Palm Plaza in São Paulo, Brazil, site of the Esri Latin America User Conference (LAUC), to be held September 25–26. Imagem Geosistemas e Comércio Ltda., Esri's official distributor in Brazil and the host, is expecting attendees from all over Latin America. In addition to Brazil, Colombia, Chile, Peru, Mexico, and Argentina will be well represented, says Imagem spokesperson Izabel Cristina Costa. As the host city, São Paulo has major credentials, having become Brazil's economic powerhouse with an increasingly vibrant nightlife, food, and fashion scene. The 2014 World Cup to be held in June and the 2016 Olympics in Rio on the horizon will only heighten Brazil's appeal. Notables scheduled to speak include Eneas Brum, Imagem's CEO; Leandro Rodriguez, manager, Esri in Latin America; Ismael Chivite, Esri ArcGIS for Server product manager; and Deilson Silva, Esri ArcGIS platform technical evangelist. LAUC 2014 will have more than GIS technology, Costa says. "We will have people talking about the benefits of using the ArcGIS platform along with the main business tools in Latin America," she says. "It will be all about benefits." Paper sessions, technical workshops, Lightning Talks, and user stories will give attendees many opportunities to share their work. The conference's main thrust will be on understanding the value of good applications focused on business challenges, she says. "Latin America is going through a season of change," explains Costa. "Subjects such as sustainability, poverty reduction, quality of life, and economic growth are the most powerful instruments of this change." Costa urged users to submit their paper abstracts: "Be the best of the best! 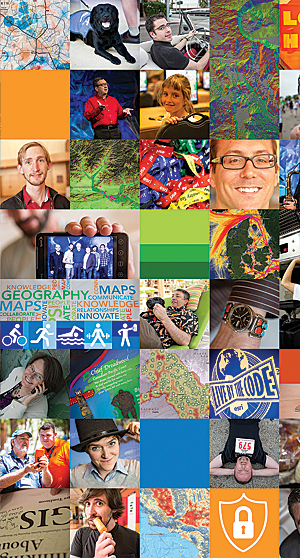 Don't miss the opportunity to share your success with others in the GIS profession." For further information, visit esri.com/lauc. Nearly 1,000 GIS aficionados from across Europe have their sights set this fall on the beautiful and historic Mediterranean city of Split, Croatia, site of the 2014 Esri European User Conference (EUC). GIS innovation and discovery will come together October 13–15 at the seaside Hotel Le Méridien Lav where attendees will spend three days learning directly from Esri staff, networking with GIS colleagues and exhibitors, and getting current on crucial industry issues. "The hope is to blend this passion for learning about GIS technology advancements with 'a joy of life' and a wonderful Mediterranean setting for a remarkable conference," says Boran Loncaric, CEO of Esri official distributor GDi GISDATA LLC—the EUC host. According to Loncaric, Croatia as host nation—along with nearby Slovenia, Hungary, Serbia, Bosnia, Herzegovina, Montenegro, Macedonia, and Albania—will provide the most participants. However, he expects many attendees from Italy, Austria, Germany, Sweden, Norway, UK, Spain, Greece, Poland, Russia, Turkey, and even the Middle East and Africa. The key topic—technology platforms, whether on-premises or in the cloud—will be covered by leading presenters from Esri, he says. The opening Plenary Session will feature Dangermond and European, Mediterranean, and regional keynote speakers, along with best practices demos. Users will hear about the latest industry trends and what to expect in coming years. An awards ceremony will honor top achievements in GIS technology, he says. "The technical Plenary Session is always the highlight of the conference, as users expect a lot of new things on display related to the Esri platform," Loncaric says. "Because Esri staff is participating, this session shouldn't be missed and should be treated as a once-in-a-lifetime experience." Expert round tables will feature moderated sessions with top experts. Paper sessions will offer a range of subjects, including some especially strong coastal and marine topics this year, such as solutions for regulating, tracking, and managing fisheries; navigation safety; coastal ecosystems; nature preservation versus tourism; and industry-and-port-driven coastal development. Loncaric encourages registrants to submit their abstracts. "Come and show others the best way forward in using GIS technology and demonstrate your successes to all of Europe and the Mediterranean," he says. Two evening parties will show off traditional Croatian hospitality, Loncaric says. One will be a real Mediterranean-style party on the beach of the Hotel Le Méridien Lav, with lots of festive music, fish, and Mediterranean food to help celebrate GDi's 25th anniversary. On the evening of the second conference day, guests will go into the historic city of Split itself to see almost 2,000 years of history and wonderful romantic settings. The main official social event will be held at the Croatian National Theater in Split, where a rich cultural program and dinner will take place. For further information, visit esri.com/euc. OpenWare Information Systems Consulting Company, Esri's official distributor in Kuwait, will host the 2014 Esri Middle East and Africa User Conference (MEAUC), to be held October 20–22, in Kuwait City. GIS users from Kuwait, Saudi Arabia, United Arab Emirates, Qatar, and beyond will be there to learn firsthand about the latest advances in Esri technology; hear Dangermond share his vision about the future directions of GIS; strengthen their knowledge and skills; and connect with Esri product specialists and GIS professionals from the Middle East and around the world. "Join us for the biggest GIS and Esri event in the region this year," says OpenWare general manager Eyad Arab. "Governments from the region will have an opportunity to exhibit GIS for their entire countries, highlighting their achievements in integrating GIS practice across multiple applications and industries." Governments will show GIS applications in action for workers and decision makers, as well as the general public, with industry tracks and user group meetings for the region's wide spectrum of industry users. "Please make sure you submit your abstract before the deadline [check the MEAUC website for updates] to get a chance to place your work and experience under the spotlight," Arab says. For further information, visit esri.com/meauc.